Delaware Area Response Team (DART) members dressed in blue hazmat suits investigate a mock hazardous material site to evaluate the phH levels and compound composition to determine the best possible scenario for containment. The drills will continue until Thursday at the historic Delaware County Courthouse. 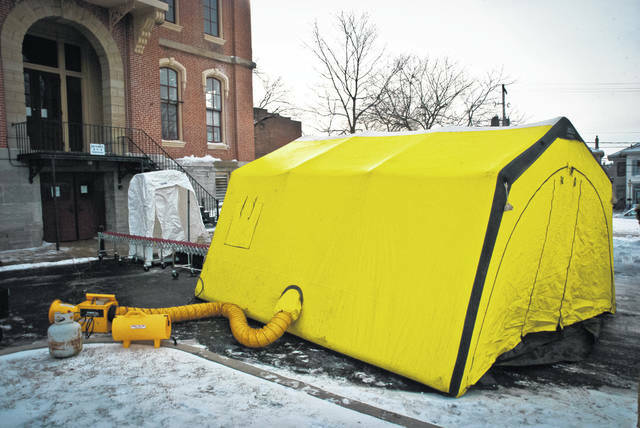 The Delaware Area Response Team (DART) on Tuesday set up a decontamination tent near the back door of the historic Delaware County Courthouse to practice decontamination techniques. While the scene in and around the historic Delaware County Courthouse on Tuesday probably had passersby concerned, the Delaware Area Response Team (DART) had everything under control as members were simply conducting hazardous material (hazmat) training. 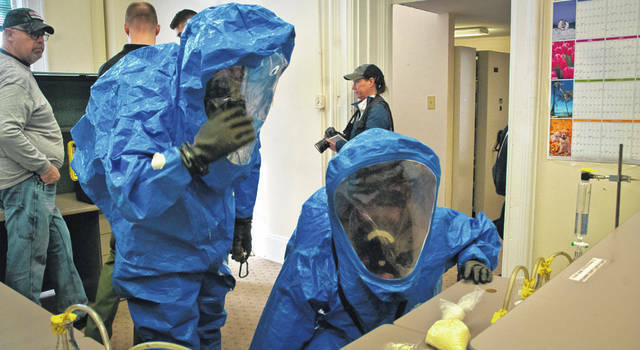 The hazmat training, which is coordinated through the Delaware County Office of Homeland Security and Emergency Management (EMA), is a three-day drill that will run through Thursday at the county’s historic courthouse located at 91 N. Sandusky St., Delaware. Miller said by having everyone involved, it helps increase awareness of hazmat situations for the individual agencies. Lieutenant Zach Wolfe, Delaware County Emergency Medical Services, is helping coordinate the three-day exercise with the county EMA. He said there are roughly 20-30 hazmat technicians from around the county that will work through the simulated training. Wolfe said DART is reworking its current model of specialty teams to be more of a cross-trained model over the next year. Wolfe said the scenario for the exercise began as a report of a noxious odor causing the skin, eyes, and nose to have a burning sensation. He said the scenario was then escalated to have four patients in need of immediate medical treatment. “We’ve also changed the focus to chemical identification,” he said. Wolfe said the Ohio National Guard 52nd Civil Support Team was acting in its capacity as a resource for DART during the exercise. Wolfe said DART was very fortunate to have the historic courthouse available for the exercise and grateful to the county facilities department for allowing them to use it. Behind the historic structure, DART set up a yellow decontamination tent at the back door where victims would normally be sprayed down with water. However, Wolfe said given the frigid temperatures, the team decided to hold off using water to decontaminate any of the simulated victims. This entry was tagged D. Anthony Botkin, Delaware Area Response Team (DART), Delaware County Emergency Medical Services, EMA director, Lieutenant Zach Wolfe, Sean Miller. Bookmark the permalink.